The Royal Coat of Arms of the Arya Cakravartti, Kings of Jaffna, dates back to the 13th century. The Royal Coat of Arms was readopted in 2005. Tradition claims that the symbols and paraphernalia of royalty were conferred by Sri Rama. The family had chosen to retain keep it symbolic its connections with locality of its origin which was famous sacred site in the Southeastern coast (Cetu) of India. The important elements of the Coat of Arms are: The Royal Crown represents the Kingdom of Jaffna. The Crown of the Arya Cakravartti, Kings of Jaffna, was conical in shape, made of Gold and studded with priceless gems such as Rubies, Diamonds, Emeralds, Blue Sapphires, Yellow Sapphires and priceless Pearls. The round Shield with a golden outline, shows several important symbols on a white background, the Bull (Nandi) couchant facing left and with its right foreleg raised. It has a hump and a large dewlap and black horns which are uncut. The Nandi with a Magenta outline is adorned with a golden chain around its neck with a golden bell attached to it. From ancient times the Nandi is considered a sacred animal and the Nandi represents strength, faith, purity and power. The Nandi is the official guard of Lord Shiva and his primary "Vehicle" (Vahana). In the centre above the bull is a white Parasol fringed with gold silk tassels and pearls are attached to the end of the hanging tassels. The Parasol is a symbol of royal authority and power. The Single Conch Shell which spiral to the right are very rare and considered especially sacred. The Conch is an emblem of power, authority and sovereignty. The Crescent and the Sun symbolize of eternity. 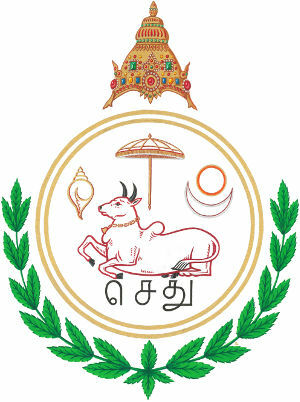 The legend "செது" is written horizontally below the arms of the bull (Nandi) in Tamil characters. The word “செது” is a reference to “Cetukavalan”. The Arya Cakravartti, Kings of Jaffna, had the epithet “Cetukavalan”, the Guardian of Cetu. The round shield is surrounded by a garland of fragrant Tulasi (Ocimum tenuiflorum also known as Ocimum sanctum or Holy basil) and it is a sacred plant in Hinduism. The worship of Tulasi plant is an ancient part of the Vedic tradition, dates back to thousands of years and continuing to the present day. The Royal Coat of Arms was drawn by Ing. C. Q. C. M. Walschots, Heraldic Artist (1986-2015) of the Hoge Raad van Adel (The High Council of Nobility). The Coat of Arms was created with the advice of the History Professors Dr. Sivasbramaniam Pathmanathan, B.A. (Hons), Ph.D. (Jaffna), and Dr. Samathilingam Sathiaseelan, B.A. (Hons), M.A. Ph.D. (Jaffna). The Coat of Arms and the Royal Symbols are reserved for the Head of the Royal Family, members of the Royal Family and the Royal Household. The Royal Coat of Arms and the Royal Symbols may not be reproduced, copied, published or used without the prior permission of the copyright holder. Any misuse of these items is deemed tantamount to abuse and considered infringing the Copyrights Act. Request for permission to publish or to use the Coat of Arms or the Royal Symbols, you will need to obtain permission. For further information please contacts us.